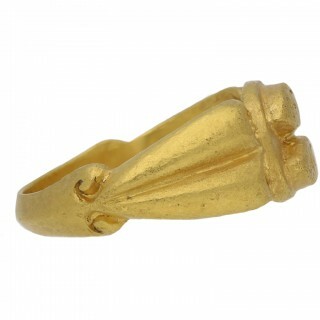 Ancient Roman ‘mother father’ gold ring. 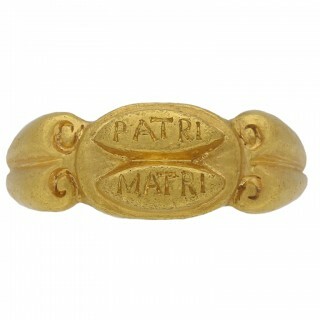 The central elliptical plaque with two raised panels inscribed ‘PATRI’ and ‘MATRI’, translated from Latin as ‘for father, for mother’, flanked by broad ridged shoulders with curling volutes and tapering through to a keeled shank. 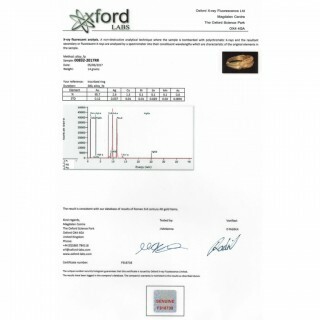 Tested yellow gold, approximately 14g in weight, circa 3rd century AD, accompanied by an Oxford Labs X-ray fluorescence report stating the composition of the metal. 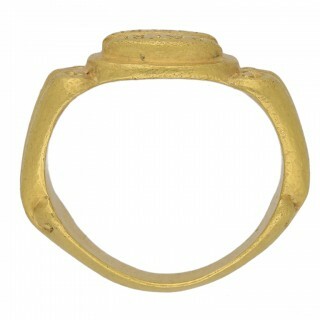 A simple ring with the same inscription was found in 2008 at the bath-house at Vindolanda, a garrison on Hadrian’s Wall, Northern England. 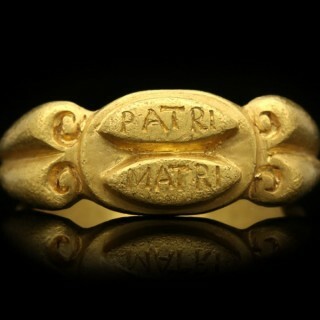 Ancient Roman 'mother father' gold ring, circa 3rd century AD.